1. 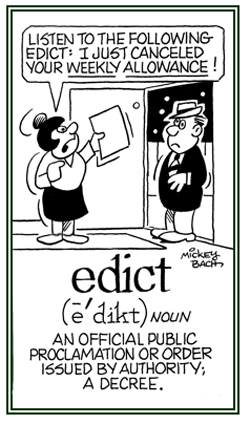 Double writing; the unintentional repetition of a letter or a word, or a series of letters or words, by a copyist: "The written material had some dittographies, or unintentionally repeated words, all of which had to be deleted from the context or be corrected." 2. 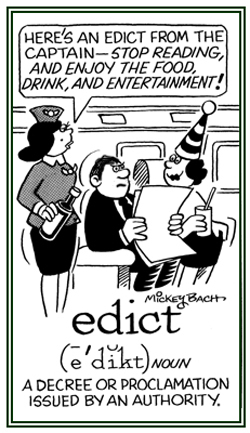 Etymology: from Greek dittos, "double" + graphy; from Greek -graphia, "writing, drawing". A short, simple, version of a popular song or the words of a poem that are intended to be sung: "After seeing his favorite musical, Harrison caught himself humming the popular ditty which had been in the production." 1. That which is proclaimed by a legal authority as a rule of action; an order issued by a sovereign to his subjects; an ordinance or proclamation having the force of law: There were edicts of the Roman praetors, and later by the emperors, and then by French monarchs. The "Edict of Nantes" was issued by Henry IV of France which granted toleration to Protestants; then this edict was revoked by Louis XIV. 2. An order or decree that is authorized by someone who has the power to enforce laws or to determine what is legal or illegal: The government issued an edict requiring men between the ages of 18 and 30 to join the military in order to defend their country against an evading army. The mayor, with the support of the city counsel, issued an edict that prohibited people from walking with their dogs without leashes so their pets could be controlled in order to keep them from being run over by cars passing by. A command or order: "The mother proclaimed an ediction to her children and husband that they were to turn off the TV and come to the table to eat their dinner." 1. Descriptive of the power to foretell future events or relating to prophecy: While Christine was sleeping, she had a dream in which she had a fatidic message telling her to avoid going on a trip because the weather would cause severe harm to her and others. 2. 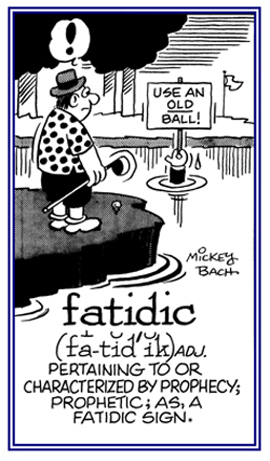 Etymology: from Latin fatidicus which came from fatum, "fate" + dicare, "to say, to speak'. © ALL rights are reserved. 1. Normally an alphabetical listing of subjects, of people, of places, or of topics; giving the numbers of the pages where they are located; the purpose of which is to assist the reader in finding specific information: "As a graduate assistant to the linguistics and language professor, Carrie created the indexes for Dr. John's two new books about various sources of current vocabulary words." 2. Something which is used to point out, to identify information on a page or a projected screen, etc. : "Jason used an index which had a bright light at the end of it to indicate the important information on his power point projection." 3. Etymology: "the forefinger (used for pointing)", from Latin index, indicis. "forefinger, pointer, sign, list, catalogue"; literally, "anything that points out", from indicare, "to point out, to indicate". The meaning of a "list of the contents of book's" is first recorded in 1580, from Latin phrases; such as, Index Nominum, "Index of Names", index expurgatorius, "specification of passages to be deleted from works otherwise permitted"; and Index Verborum, "Index of Words" which was used as headings in English books of that time. The Catholic Church sense of "forbidden books" is from index librorum prohibitorum, which was first published in 1564 by the authority of Pius IV. To put information in an alphabetical or logical sequence for the use of a reader: "For his summer job experience, Leon was indexing the information about community service organizations for his city councilor." 1. An official list formerly compiled by the Roman Catholic Church of books and other publications which Church members were forbidden to read: "The first Index was issued in 1557 and it was revised at different times until it was abolished in 1966." 2. Etymology: from Latin, "list of forbidden books". Oxford University Press, Inc.; New York, N.Y.; 2010; page 883. A system of economic regulation in which wages, taxes, pension benefits, or interests are linked to the cost-of-living report so they are automatically adjusted up or down as it rises or falls: "The Minister of Finance issued a biannual indexation on the state of the economy, including information regulating pensions, wages, etc." 1. To point out, to point to, to make known, or to show: Ted Carson, the driver of the tourist bus, asked the tourist agent to indicate the interesting sites to visit in the city. 2. In medicine, to designate a remedy or method of treatment: The presence of a high fever seemed to indicate to Dr. Jonas that the patient might have appendicitis and would require immediate surgery. 3. A course of action, treatment, etc. which is to be suggested as desirable or necessary: The librarian, by directing attention to the SILENCE PLEASE sign, was indicating that the students were being too loud! 4. To direct attention to the presence or existence of a signal: The sailors believed that a red sky in the evening indicated that the next day would be good for sailing because of the saying: "Red sky at night, sailor's delight; red sky in the morning, sailors take warning". 5. To turn direct attention to by using the hand to signal an action: The outline of a hand on the traffic sign indicated that the bus should turn left to continue the trip to the sea side. 6. To state or express something by some small action without details: Alison's smiling face indicated that she was happy to be going shopping with her mother. That which points out, states or declares, typically suggesting the mood of the speaker when making a statement: "Ted's bitter remarks represent the indicative he still feels about losing his job." 1. Pertaining to a suggestion of something: "Henry had pains that were indicative of a possible heart attack." 2. Relating to the grammatical mood of a verb that is used in ordinary factual or objective statements: "The sunnier the day, the more indicative of spring was what Sue thought when looking out the window." 1. A person who or that which points out, or directs attention to, something: "The employee standing just inside the door at the department store was the indicator who knows the store well and so he is able to let patrons know where to find their desired items." 2. A mechanical device, or a recording instrument, that presents the condition of an apparatus, etc., to which it is attached: "The indicator on the panel of the car indicated that the gas tank was almost empty."